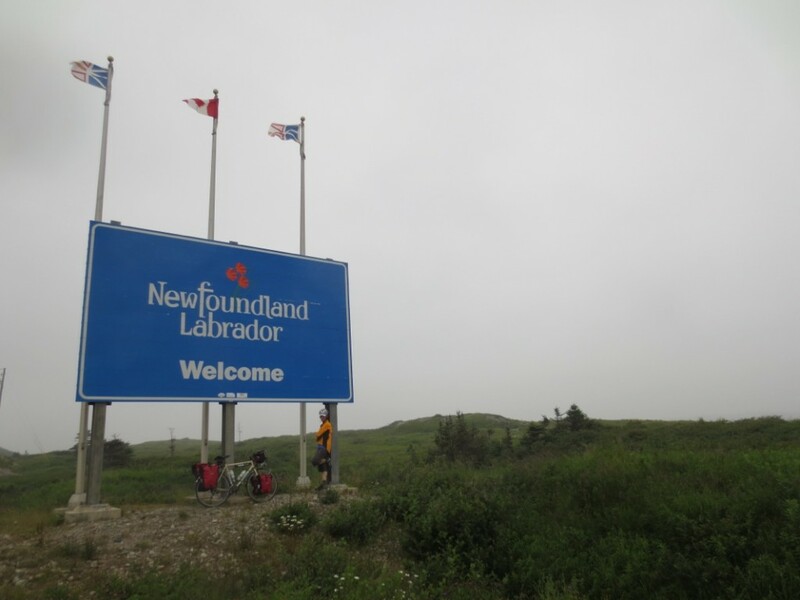 The fog rolled in as the ferry entered port, it started to drizzle which became heavy rain at times, and as I pulled out of the visitors centre to begin the 900km trek across my last province, I heard the foghorn in the distance; it was the most Newfoundland of welcomes. Every misty, foggy picture you’ve ever seen probably looked at lot like what I was seeing. It remained wet all day and even as the fog lifted in spots, the mountains I passed remained shrouded. As endearing as it all was, it does make for a very soggy close of day. Finally some actual views of the Atlantic, not a gulf, bay, or strait but the Atlantic Ocean! The remaining industry on Cape Breton seems to be tourism. Coming down the coast today, the only towns that flourish, like Ingonish, are located around the beautiful beaches that draw tourists like myself. On the map, many towns exists along the coast, especially closer to the Sydney area but little remains of them today. I saw numerous smaller churches converted to art studios or for sale. Certainly a lovely use of empty buildings but the absence of people haunts them nevertheless. My favorite was a church turned into a Gaelic singers’ hall but it looked abandoned. 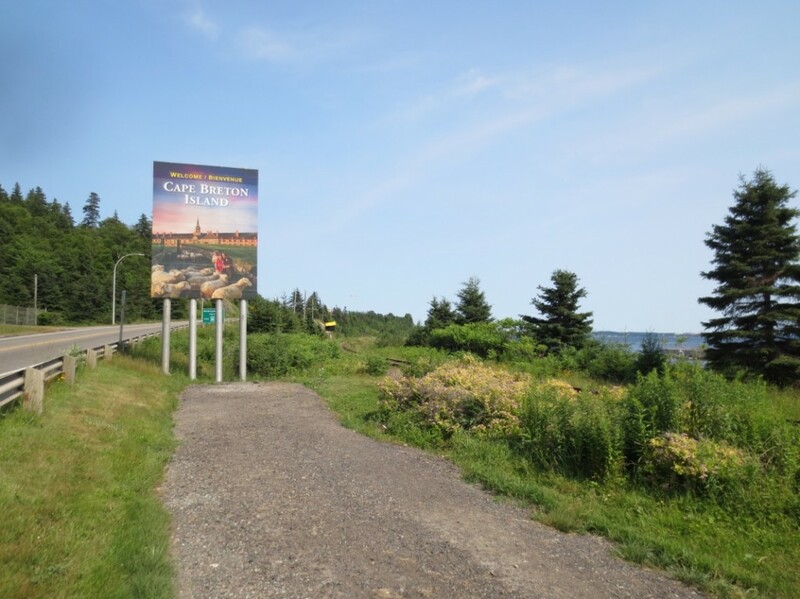 With continuing dread and anticipation I set out early for the Cabot Trail; today was the day of days in this little detour through Cape Breton. And if I wasn’t carrying enough trepidation, I met the groundskeeper for the campground who reaffirmed the difficult climbing ahead. As an aside, I learnt down the road that he was the brother of Elisabeth May, the leader of Canada’s Green Party. Turns out their mother was an anti-war, anti-nuke protesters during the Nixon administration who discovered Cape Breton and moved her family there. This information came from another expat who’s been coming to summer and paint in Cape Breton for about 40 years. There are many people from the US who seem to live here part of the year. What a gorgeous, gently ride up French Mountain. Not! I’m seeing signs announcing local ceilidhean all over the place (I think that is the plural of ceilidh). Unfortunately, most are on Sunday evenings so I haven’t had the chance to just drop into one of these social, musical gatherings. To attend a ceilidh and hear the fiddlers tearing away would be to experience one of the island’s proudest traditions. All day I racked my brain trying to piece together something interesting to write about. All I got were little snippets that don’t amount to much. You see it was a transit day of sorts in my final few weeks to get to St John’s, NFLD. I finished PEI yesterday and tomorrow I’m planning to start the trek around Cape Breton Island. 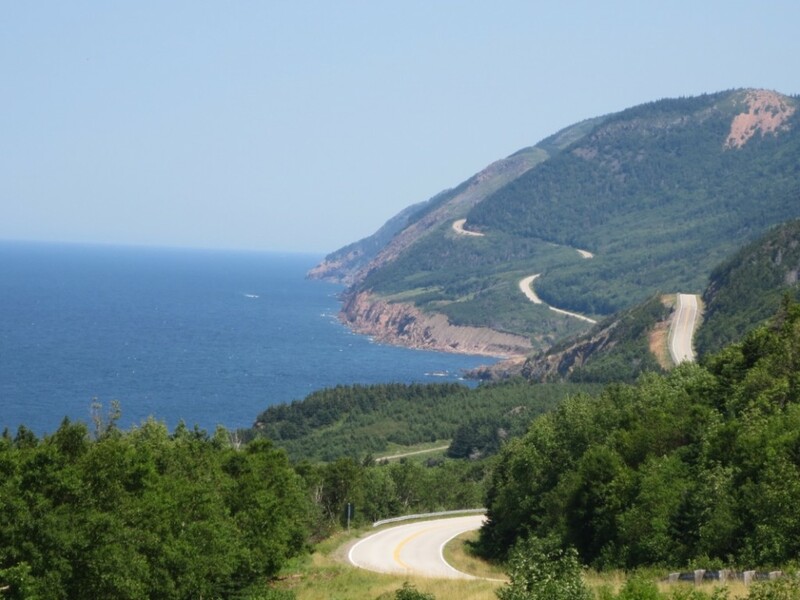 The plan is to cycle the Cabot Trail, which is world renowned for its spectacular beauty. One sign beside the road welcomed me to explore “the masterpiece” ever so humbly. This is all well and good but I also know this coastal route promises the steepest grades I have seen so far. All to say I approached the island with a mixture of dread and anticipation. From the causeway onto the island, it’s only about a day’s cycling to get to the ferry for Newfoundland. A small part of me seriously contemplated making a beeline for the ferry but I’m also stubborn enough to resist that particular temptation. I’m sure I’d always regret not taking the three days or so to cycle around Cape Breton. I made it to Cape Breton! 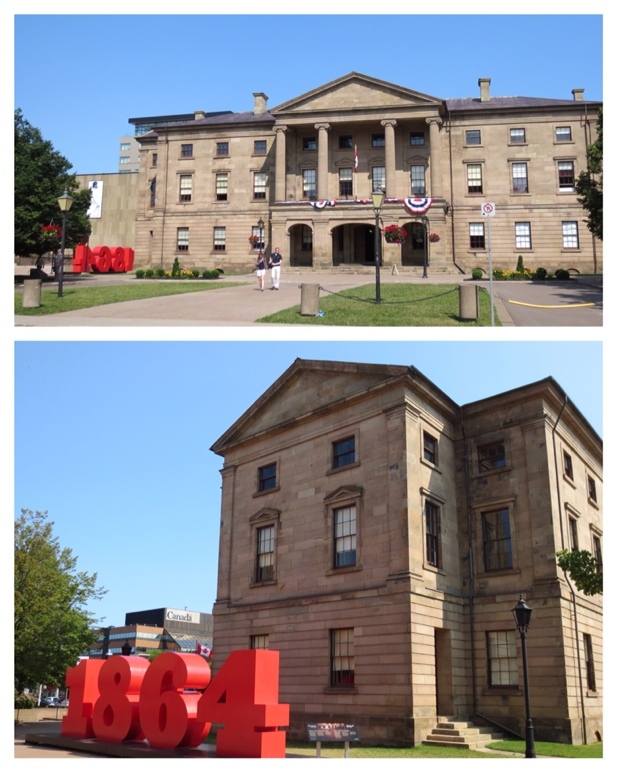 Prince Edward Island, and Charlottetown in particular, is celebrating 150 years since the first conference that lead to the formation of the Dominion of Canada. What happened is an interesting story and it’s also ironic that PEI is throwing this 70 day festival so I will tell it. 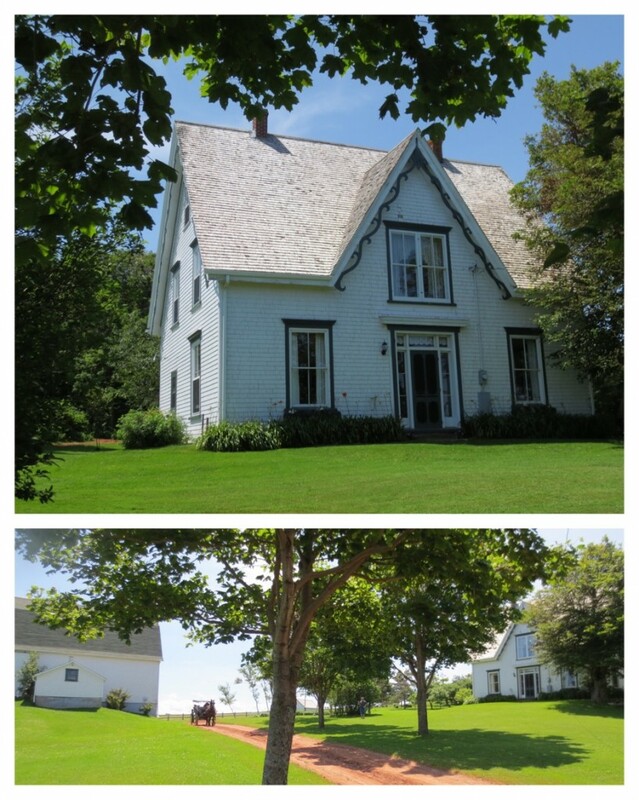 Prince Edward Island is a wonderful mixture of agriculture and tourism with some fisheries around the edges. The island is known as a tourist destination for good reason. The coasts and villages leave you awing at every turn. 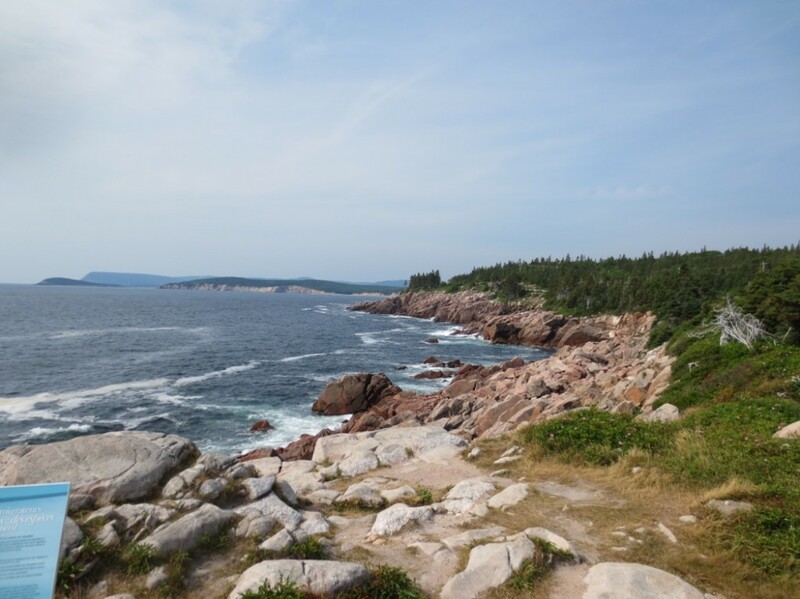 Instead of taking the shortest route across the island to Nova Scotia, I decided to take a day’s jaunt exploring some of the coastlines. With the sun shinning, neither the rolling hills nor winds could get me down. My only complaint is that the most scenic coastal roads have no shoulder. Since all the other tourists are also rolling along here in their tin boxes, it makes for a mentally exhausting day but people were patient and generally allowed me a wide berth. I’ll let the pictures describe the views for me. You may have noticed the number of pictures I post, how many I take even more so, is a good indicator of my mood and how anxious I am about getting to my destination. 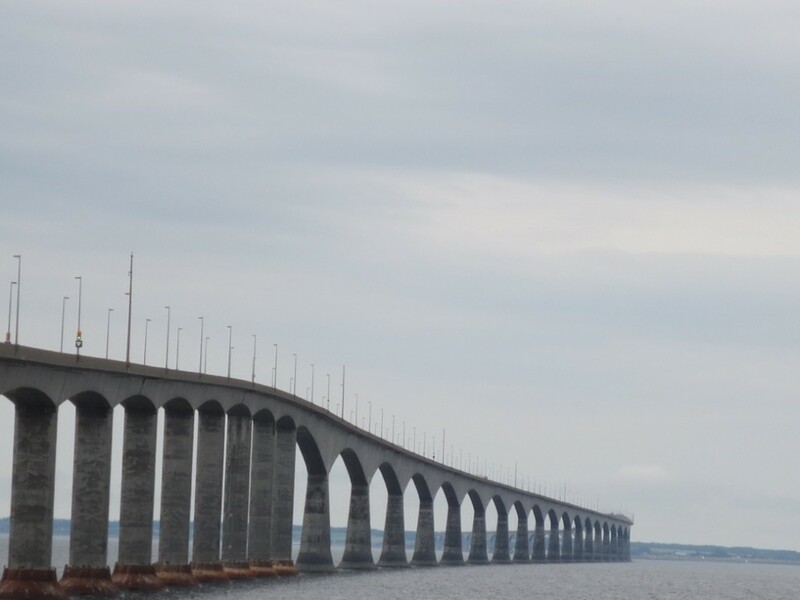 Approaching Confederation Bridge today, I couldn’t help but feel excited. 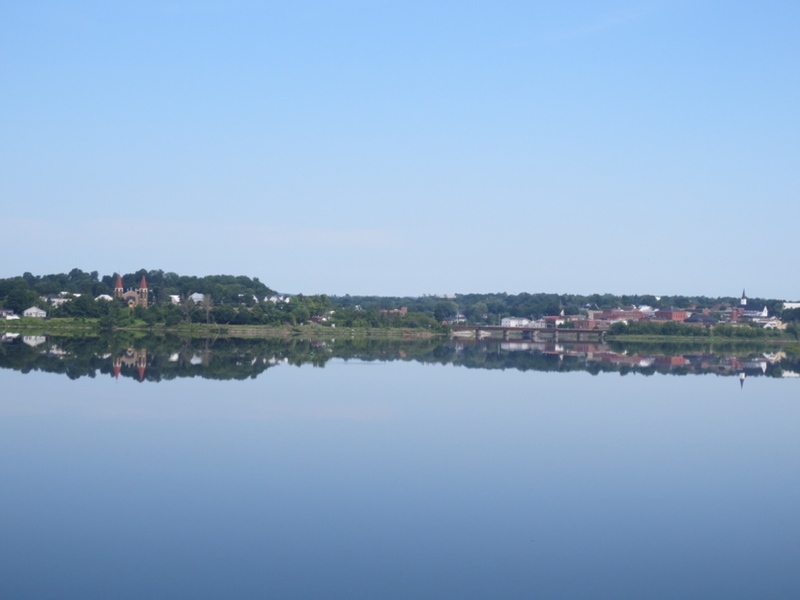 Even though the trip is far from over, it seems like an auspicious moment to cross onto Prince Edward Island, almost as if all that’s left is to cross some t’s and dot some i’s. Now they are some hefty remainders but the anticipation grows. And then as if to welcome me, a vibrant double rainbow appeared on the island while I cross the bridge by shuttle. (You can’t walk or bike the 12.9km bridge). The rainbow over the red cliffs on the shore certainly made an impression. I don’t know if it was the red dirt so much like that in Paraguay or just my exhilaration at having made it this far but I could almost sense the feeling of coming home that islander often talk about it. With frequency, it may become routine but the crossing is an event not unlike landing at the airport though thankfully without the intrusive security. 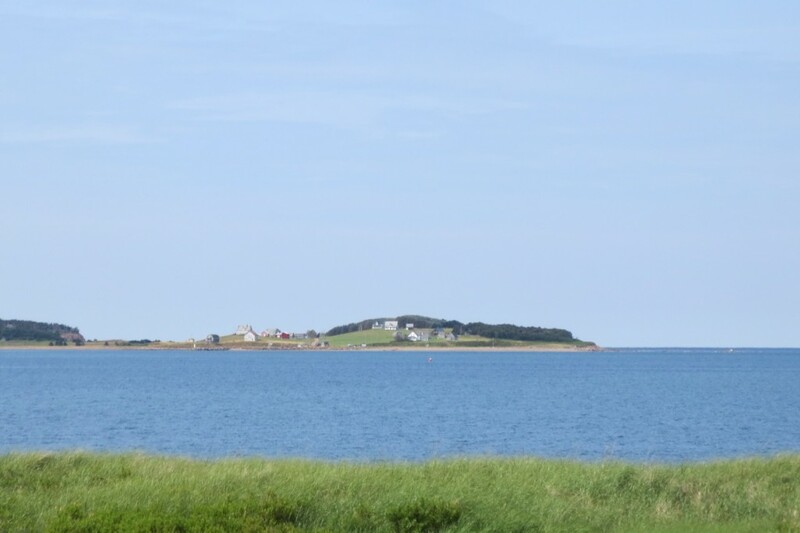 PEI in fact offers free passage to all onto the island but charges to leave: a reluctant good-bye or honey trap of sorts? Confederation Bridge to Prince Edward Island. Another province completed! Neither my route nor schedule is fixed or preplanned as I’ve mentioned previously. I have a general sense of where I’m going but beyond that options abound. As someone who’s not particularly keen about the unknown or unscheduled, I have to be intentional or deliberate about maintaining the impromptu. Ironic isn’t it? Not preplanned, choosing a path sometimes requires some interesting divination. Pulling up behind a car at the first intersection this morning, I got a sharp rebuke of sorts for my griping yesterday. The motto on the New Brunswick license plate was “Be…In this Place” (and the French version which I didn’t memorize). It was like the universe tapping me on my nose to remind me the whole point of the trip was to experience the different parts of Canada. Sometimes what you wish for entails a little more than you intended. New Brunswick certainly falls in that category. I tried my utmost to settle into the idea of cycling through this province but it is darned hard. The hills are unrelenting and frankly the communities are rather threadbare around the edges. The roads along the river are dotted with the remnants of a more prosperous past: grand old homes constructed primarily of wood but now falling apart or boarded up, a variety of old graveyards though often the churches are no longer standing. 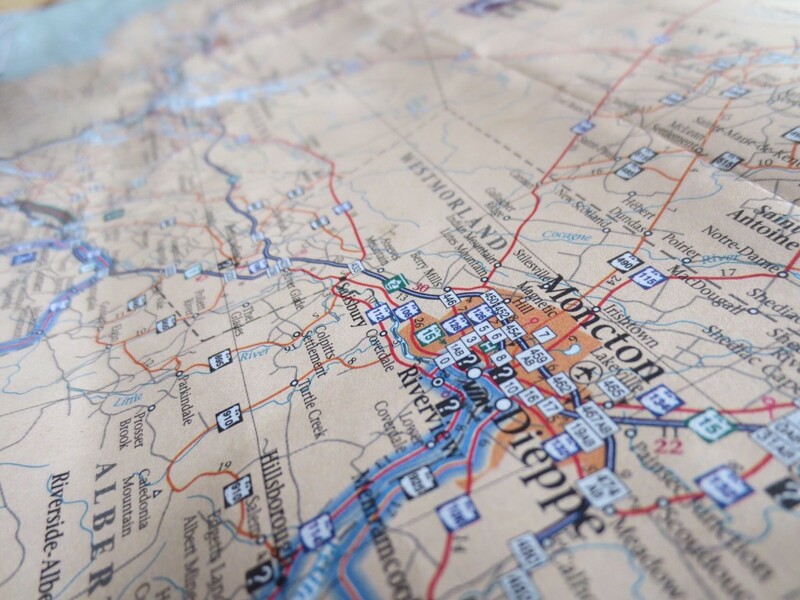 I read someone online describe New Brunswick as the Deep East. It feels right but Appalachia has come to mind numerous time. Many of the newer homes are trailer homes, which gives you some sense for the scene. Perfect serenity in Woodstock, NB. Now this is a place you could just be.